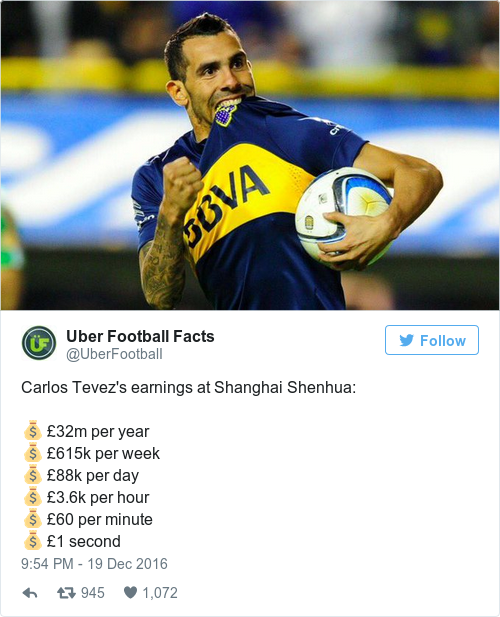 CARLOS TEVEZ HAS been offered a world-record wage to join Shanghai Shenhua, according to widespread media reports. Chinese Super League club Shanghai Shenhua are understood to have offered £615,000 (€729,000) a week — a fee that roughly amounts to £1 a second — for Tevez, who currently plays for Boca Juniors, to join them. The 32-year-old ex-Man United striker is believed to be weighing up the lucrative offer, with Argentina’s La Nacion newspaper claiming he would earn more than Barcelona superstar Lionel Messi should the deal be finalised. Tevez is seen as a hero in his native Buenos Aires and any move abroad would go down badly with local fans who idolise the 75-times-capped Argentina international. The star scored in Boca’s 4-1 victory against Colon at the weekend, while a fan ran onto the pitch during Sunday’s game and pleaded with him to stay at the club. Tevez joined Boca from Juventus in 2015 and has scored 40 goals in two spells at the club. Email “Carlos Tevez will earn £1 a second if he moves to China - reports”. Feedback on “Carlos Tevez will earn £1 a second if he moves to China - reports”.